FERNÁNDEZ, Joachim Octave, a Representative from Louisiana; born in New Orleans, La., August 14, 1896; attended the public schools and Cecil Barrois School in New Orleans, La. 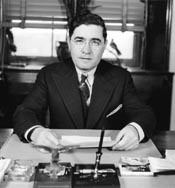 ; demurrage and storage tariff expert from 1921; delegate to the State constitutional convention in 1921; member of the State house of representatives 1924-1928; served in the State senate 1928-1930; elected as a Democrat to the Seventy-second and to the four succeeding Congresses (March 4, 1931-January 3, 1941); unsuccessful candidate for renomination in 1940 to the Seventy-seventh Congress; called to active duty as a lieutenant commander in the United States Naval Reserve on January 8, 1941, and served until placed on the inactive duty list on September 30, 1943; appointed collector of internal revenue for the district of Louisiana in September 1943 and served until October 1946; engaged in the general tax business and as a tax consultant; in 1951 employed as revenue examiner for department of revenue, State of Louisiana, and head of income tax section; resided in New Orleans, La., where he died August 8, 1978; interment in Metairie Cemetery. Joachim Octave Fernández in Hispanic Americans in Congress, 1822-2012. Prepared under the direction of the Committee on House Administration by the Office of the Historian and the Office of the Clerk, U.S. House of Representatives. Washington: Government Printing Office, 2013.